Were Half of Recently Declassified UFO Reports CIA Flights? 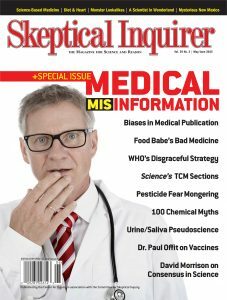 In the pages of the Skeptical Inquirer and elsewhere in the skeptical literature, you can read about a seemingly endless array of snake oil remedies, dubious health claims, questionable practices, ineffective regulation, and shortcomings of mainstream medicine. In an interview with Lindsay Beyerstein on the Point of Inquiry podcast, Offit spoke about the early 2015 measles outbreak at Disneyland, the anti-vaccination movement, and the importance of vaccination. Bias in Reporting of Medical Research: How Dangerous Is It? While “Food Babe” Vani Hari’s pseudoscience has been widely debunked by qualified doctors and scientists, a more sobering fact seems to have escaped everyone’s attention: one of America’s most notorious bloggers is earning sales commissions from products that contain the very same ingredients she says are dangerous. The World Health Organization once again advocates for implementing complementary and alternative medicine in national health services, jeopardizing global public health and evidence-based medicine. Pesticides: Just How Bad Are They? Scientific balance and objective assessments of evidence are necessary to avoid biased and misleading answers to concerns about pesticides.